20 inch Personalized Silk Designer Christmas Stockings. Flocked Silk Stocking body with Olive Velvet Venetian Ruffle Cuff and Metallic Gold Trim. 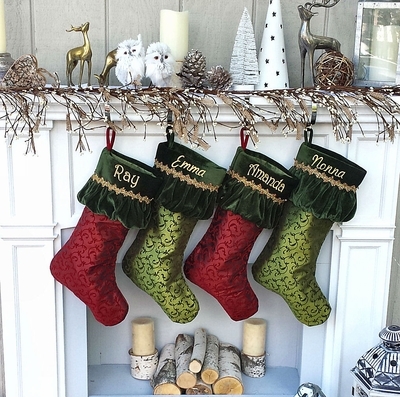 We have a same personalized stocking in red so you can make a set. Measurements: These designer flocked silk Christmas stocking measure 20" long along the diagonal from the top of the cuff to the toe; and the width across the cuff is 8". Materials: Flocked Silk Christmas stocking body with olive green velvet Venetian ruffle cuff, trimmed with sparkling gold metallic ribbon. Inside Lining: Yes, this stocking is lined inside with polyester satin lining. What if I need more of these Christmas stockings in the future years? We have been bringing this Christmas stocking to our inventory since 2010 and the likelyhood of our keeping this personalized Christmas stocking or a similar one in stock next season is undetermined. This is a special seasonal designer stocking that may be replaced by a new designer fabric--- so get some extra blank ones if you can.